Learn about the different districts of Boston, see Beacon Hill, The Old Statehouse and where the Declaration of Independence was read to the waiting citizens of Boston on the Historic Boston Tour. Enjoy Lunch at Quincy Market. Experience the exhilarating thrill of attending the Boston Pops Rehearsal Concert at the Hatch Shell along the banks of the Charles River. The 4th of July is a very special day starting with Harvard narrative drive-by-tour . Then it's over to the Seaport to take a Boston Harbor Cruise featuring a special bountiful buffet lunch including Boiled Lobster. Sail the Boston harbor aboard Spirit of Boston and see beautiful harbor views as you follow the USS Constitution. After the cruise visit the JFK Library and Museum. Tonight is another highlight of your tour which is the 4TH OF JULY Fireworks on the Esplanade. 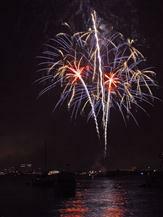 The grand finale is the 1812 Overture, played in time with 4th of July fireworks, exploding with the music, over the Charles River! Enjoy a visit to the Charlestown Navy Yard where you will see the USS Constitution, visit the Navy Yard Museum and Visitors Center. Also, included in this stop is a self-guided tour of the USS Cassin Young, a WWII Navy Destroyer. There is a lot of walking on this tour. You will have to bring your own folding chair and carry it for the Boston Pops Rehearsal concert.